Former Indianapolis offensive coordinator Pep Hamilton is joining Hue Jackson's staff in Cleveland. New Cleveland Browns head coach Hue Jackson has added to a pair of former Indianapolis Colts assistants to his coaching staff as he looks to turn around Browns. 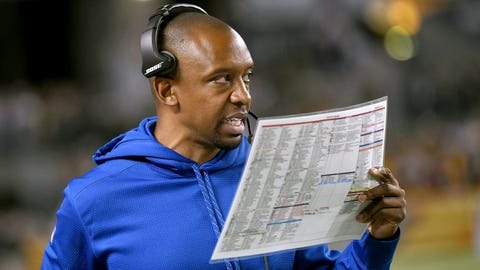 On Friday, the Browns announced the hirings of Pep Hamilton as assistant head coach-offense and Hal Hunter as offensive line coach among a series of moves made by the team. Hamilton spent two-plus seasons as the Colts’ offensive coordinator before being fired in November amid a 3-5 start. Indianapolis finished 11-5 in Hamilton’s first two seasons running the offense, with quarterback Andrew Luck throwing an NFL-high 40 touchdowns in 2014. Hunter spent three seasons with the Colts before being let go earlier this month. He served as assistant offensive line coach for two seasons before being promoted to offensive line coach in 2015. Hunter’s father, Hal Hunter Sr., was Cleveland’s offensive line coach from 1989-92.